Ahimsa (Sanskrit: अहिंसा; IAST: ahiṃsā, Pāli: avihiṃsā) is term meaning "not to injure", derived from the Sanskrit root hiṃs – to strike (hiṃsā is injury or harm, a-hiṃsā is the opposite of this, i.e. cause no injury, do no harm). Ahimsa is also referred to as nonviolence, and is one of the cardinal virtues and an important ethical and mystical tenet of Jainism, Hinduism, and Buddhism. It can involve many complex and multidimensional concepts, inspired by the premise that all living beings have the spark of the divine spiritual energy (prana), and relationships of Karma, and that to needlessly oppress any being is to hurt oneself, and all beings, in ways that can be obvious or mysterious. Strongly inspired by Hindu and Jain concepts of ahimsa, Mahatma Gandhi popularized many of its strategies worldwide, among people of many diverse traditions. Man cannot pretend to be higher in ethics, spirituality, advancement, or civilization than other creatures and at the same time live by lower standards than the vulture or hyena … The Pillars of Ahimsa indisputably represent the clearest, surest path out of the jungle, and toward the attainment of that highly desirable goal. God is truth. The way to truth lies through ahimsa (nonviolence). Ahimsa is the highest ideal. It is meant for the brave, never for the cowardly. The highest religion has been defined by a negative word: Ahimsa. Dharma is one and only one. Ahimsa means moksha, and moksha is the realization of Truth. The most distinctive and largest contribution by Hinduism to India’s culture is the doctrine of Ahimsa. No power on earth can subjugate you when you are armed with the sword of ahimsa. It ennobles both the victor and the vanquished. To attain to perfect purity one has to become absolutely passion-free in thought, speech and action; to rise above the opposing currents of love and hatred, attachment and repulsion. I know that I have not in me as yet that triple purity, in spite of constant ceaseless striving for it. That is why the world's praise fails to move me, indeed it very often stings me. To conquer the subtle passions seems to me to be harder far than the physical conquest of the world by the force of arms. Ever since my return to India I have had experiences of the dormant passions lying hidden within me. The knowledge of them has made me feel humiliated though not defeated. The experiences and experiments have sustained me and given me great joy. But I know that I have still before me a difficult path to traverse. I must reduce myself to zero. So long as a man does not of his own free will put himself last among his fellow creatures, there is no salvation for him. Ahimsa is the farthest limit of humility. Non-violence is not a cover for cowardice, but it is the supreme virtue of the brave. Exercise of non-violence requires far greater bravery than that of swordsmanship. Cowardice is wholly inconsistent with non-violence. Translation from swordsmanship to non-violence is possible and, at times, even an easy stage. Non-violence, therefore, presupposes ability to strike. It is a conscious deliberate restraint put upon one's desire for vengeance. But vengeance is any day superior to passive, effeminate and helpless submission. Forgiveness is higher still. Vengeance too is weakness. The desire for vengeance comes out of fear of harm, imaginary or real. A dog barks and bites when he fears. A man who fears no one on earth would consider it too troublesome even to summon up anger against one who is vainly trying to injure him. All great saints and spiritual leaders who have appeared in the world have come to establish world peace and unity for humanity as a whole. Jealousy and hatred are the two causes by which humanity is ruined. In your lives these two vices should have no place. I want to weed out the prevailing non-violence in the world. It is a cause of apathy and idleness. This non-violence has cooled the blood of men so that it has become like cold water. This attitude of non-violence produces a lack of discrimination between good and evil. Everyone should lead a life of bravery and courage. A man without courage is like a dead man. Life without courage is no life. At present, many atrocities are being committed in the world. Human beings are treated like animals. No one has had the courage to stand up against these atrocities but everyone should be brave and resist them. Lethargy must have no place in your lives. Lethargy is the weakest trait in man. 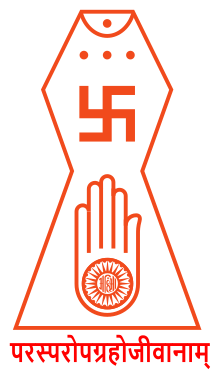 Jainism actually is a religion of peace. The core principle of Jainism is non-violence. Gandhi got his non-violence from the Jains. The crazier you get as a Jain, the less we have to worry about you. Jain extremists are paralysed by their pacifism. Jain extremists can't take their eyes off the ground when they walk lest they step on an ant … Needless to say they are vegetarian. 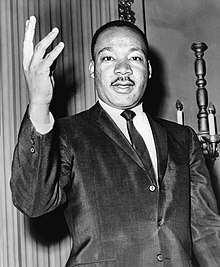 The intellectual and moral satisfaction that I failed to gain from the utilitarianism of Bentham and Mill, the revolutionary methods of Marx and Lenin, the social contract theory of Hobbes, the "back to nature" optimism of Rousseau, and the superman philosophy of Nietzsche, I found in the nonviolent resistance philosophy of Gandhi... ~ Martin Luther King, Jr.
Ahimsa is the best austerity [tapas]. Ahimsa is the greatest gift. Ahimsa is the highest self control. Ahimsa is the highest sacrifice. Ahimsa is the highest power. Ahimsa is the highest friend. Ahimsa is the highest truth. Ahimsa is the highest teaching. The purification of one who does ahimsa are inexhaustible. Such a one is regarded as always performing sacrifices, and is the father and mother of all beings. Ahimsa is the dharma. It is the highest purification. It is also the highest truth from which all dharma proceeds. All beings hate pains; therefore one should not kill them. This is the quintessence of wisdom; not to kill anything. Souls render service to one another. Umaswati, in Tattvartha Sutra 5.21; this is a motto accepted by all Jains. Variant translations: All life is bound together by mutual support and interdependence. This is also sometimes paraphrased or summarized as "Live and let live" or "Live and help Live." In happiness and suffering, in joy and grief, we should regard all creatures as we regard our own self, and should therefore refrain from inflicting upon others such injury as would appear undesirable to us if inflicted upon ourselves. This is the quintessence of wisdom; not to kill anything. All breathing, existing, living sentient creatures should not be slain, nor treated with violence, nor abused, nor tormented, nor driven away. This is the pure unchangeable Law. Therefore, cease to injure living things. All living things love their life, desire pleasure and do not like pain; they dislike any injury to themselves; everybody is desirous of life and to every being, his life is very dear. This page was last edited on 24 April 2018, at 18:43.